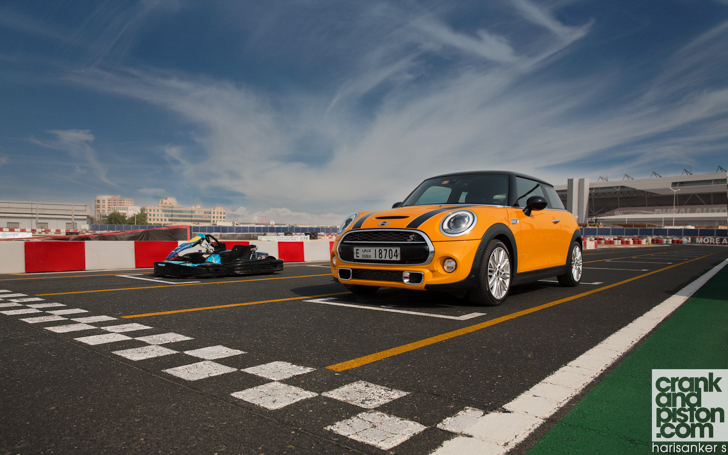 crankandpiston.com pits the brand new MINI Cooper S against a Honda-powered Sodi go-kart to find out just how accurate the ‘go-kart feeling’ in the hatchback really is. It’s not often, as some of my wordier pieces on crankandpiston.com will attest, that I’m left speechless. But as I stand here, the stopwatch on my iPhone paused and bearing a lap time I can barely comprehend, it’s about the closest I’ve ever come. Rewind the clock a few months. Back in March, crankandpiston.com flew to Puerto Rico to test the brand new MINI, and for reasons greater than stockpiling those frequent flyer miles. With a heritage dating back to 1959, BMW Group’s MINI made its first tentative steps onto hallowed ground in 2001 with a sea of criticism just waiting in the wings. As well as being as nimble and appealing as its 44-year old ancestors, the new MINI had to be much more than ‘just a small BMW’: it needed ‘character’. A flood of orders confirmed that the first of BMW’s hurdles had been triumphantly cleared. Ironically, some 13 years later, BMW found itself in the same position. This time though, the pressure for commercial success with ‘the new MINI’ was considerably greater. With six new model lines established in the intervening years – including SUVs, cabriolets and estate cars, all to mixed reviews – MINI was no longer ‘just’ a quirky city car but a burgeoning business model. To redesign the Hatch – the centre of that growing empire – and produce a clanger would spell disaster for consumer confidence in the brand. Once again though, BMW delivered, the new Cooper proving more practical and technical than ever though no less nimble and characterful. Thanks in part to ‘its typical go-kart feeling’, as emphasised by both MINI’s official press material and pretty much every article written on the model across the globe. And this got us thinking. Just how accurate is this clichéd expression? Does the brand new MINI actually feel like a go-kart to drive, and if not, what is missing from the formula? We decided to find out once and for all by pitting the brand new Cooper S to a one-lap shootout around our local outdoor go-kart circuit. Against an opponent. You join us early morning in the pitlane at the Dubai Kartdrome, where our two contenders for the day are busy being prepped for their hotlaps. The main source of interest is our Cooper S test model, a bizarre yet formidable sight squeezed as it is into one of the Kartdrome’s six-foot wide pit garages. Indeed, so narrow is the gap between the door paint and the concrete wall that Ryan Trutch – Dubai Kartdrome Manager and our designated driver for the day – has difficulty sliding into the sports seat, much to my childish amusement. I do occasionally remember to be professional though, paying attention to the new MINI’s looks. At a glance, you’d be hard pushed to tell the difference between the third generation Cooper S and its predecessor, and given that the outgoing model was a rather handsome brute, that’s no bad thing. The ‘hallmark emotional design’ of the Cooper S though comes with a re-designed front bumper and bonnet scoop for a more dynamic look, plus the time-honoured ‘S’ on the hexagonal front grille. It’s a similar situation at the back where a new rear slip adds new energy to an otherwise familiar appearance. In-between laughing at Ryan, who’s now struggling to get out, I pay particular attention to the centre-mounted twin tailpipes (a pretty cheeky addition) and the bespoke 18-inch alloy wheels, an inch bigger than those on the standard Cooper. 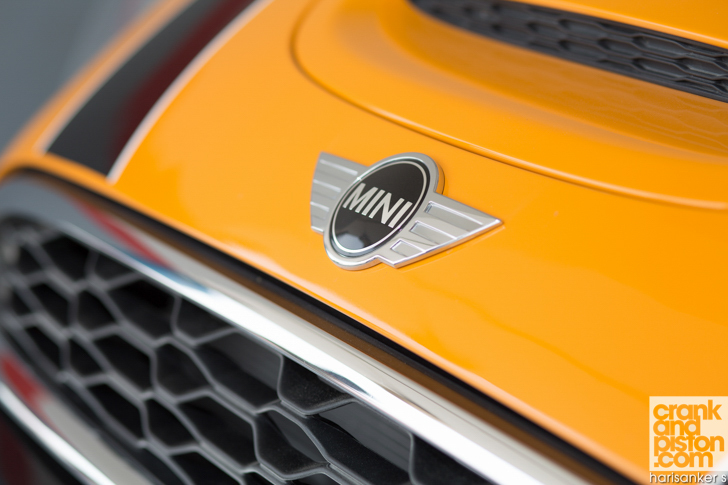 I’m also pleased to see that MINI hasn’t toned down the exterior as it has done on the inside, with Volcanic Orange and go faster stripes across the bonnet a characterful addition to the brood where perhaps fine leather upholstery and greater legroom on the inside does not. 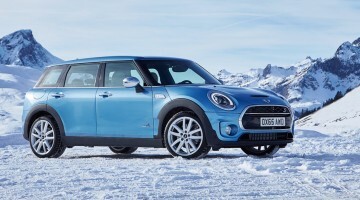 Don’t forget that, in growing up, the MINI now comes with an all-new platform and longer wheelbase. Turns out that 7mm extra height, 98mm extra length and 44mm extra width makes a difference to the passengers in the back. That’s not to say the cabin isn’t a striking place to be, as Ryan suggests (having abandoned his efforts to clamber out) and as I agree by peering through the windscreen. Retro features like the half-spherical door handles, floating speedometer and flickswitches remain, and I’m particularly keen on the ‘panic button red’ stop/start switch: I feel like I’m about to open fire on Red Dawn every time I use it. MINI though has abandoned the centre speedometer in favour of a more traditional digital readout in front of the driver (plus head-up display as part of the updated driver assistance systems) and a centre-mounted satnav. The formerly fiddly infotainment rotary dial by the gearlever has now made bigger and mounted closer to the driver for ease of use, and a new rotary dial around the gear lever makes the task of swapping from Sport to Green driving modes that much easier. And to re-emphasise a cliché: select Sport mode and you are told, via the centre-mounted 8.8-inch infotainment screen, to expect ‘maximum go-kart feel’. Time to put that to the test. As our contenders line up on the starting grid and our video and photography crew leaps in for detail shots, we are joined by Kartdrome Assistant Manager David Bright, who will be piloting the go-kart on its hot lap. He’s mad keen to show what the Honda-engined Sodi – among the venue’s most respected models – can really do on-track, even if he’s a little worried about the spiralling heat. “With cold slick tyres, hot weather and dusty conditions, it’s almost like driving on a circuit after a thunder storm,” he explains, noting that a typical lap time –1m 11s (ish) around the Kartdrome’s 1.2km National configuration – could go up quickly. Nerves though seem a little misguided when we consider the equipment at David’s disposal. Started by a pull handle by the driver’s seat, the 390cc engine chucks out 13.5hp and is capable – given a straight enough piece of tarmac – of hitting 85kph. Whilst that may not seem much compared with the MINI, the weight difference between the two is herculean, the Sodi’s sprightly 160kg giving it an enormous advantage over the MINI’s comparatively portly 1160kg. Also unlike the MINI, the go-kart is built without ABS and power steering (for the purposes of weight and ‘true driving connection’), and the heavier steering and left-foot braking required means David will have to work much harder through the turns. The go-kart’s tighter turning circle however means that David will be able to flick the go-kart into the corners much quicker and at tighter angles, allowing him to get the power down much faster than the MINI. It’s through the corners that the shootout will be won. Realistically though, none of us are expecting the MINI to beat the go-kart. 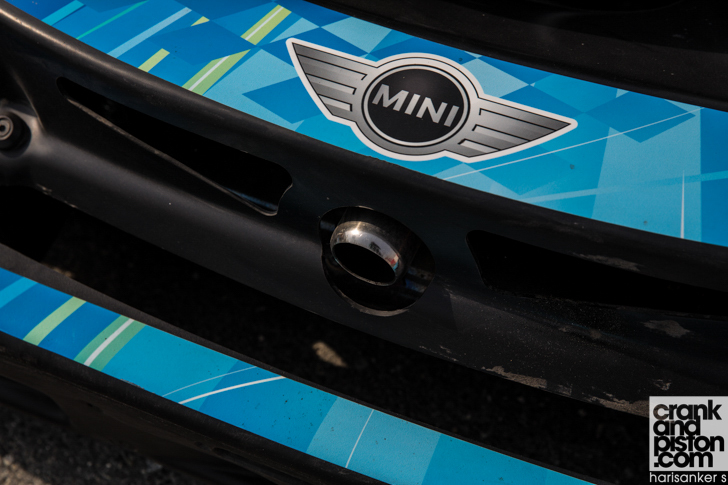 Even despite its 178.5hp advantage, the MINI’s 1000kg weight deficit – plus its comparatively high centre of gravity – makes the Cooper S a sitting duck around the Kartdrome’s tight and twisting technical layout. Based on David’s experience, he estimates the MINI will be 8-9 seconds slower than the go-kart. Anything under that should demonstrate the new Cooper’s ‘go-kart like’ precision. 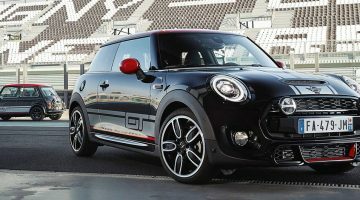 Mini Cooper S GT Edition – a modern-day Mini 1275GT?